Omega Centauri, the Hercules cluster, M3: together with 47 Tucanae, visible from the southern hemisphere, these are three of the biggest, brightest, and most beautiful of the globular clusters. On dark, moonless nights, they are visible to the naked eye—for northern hemisphere observers, M3 and the Hercules cluster are high in the sky on summer nights, while Omega Centauri, at a declination of about —47°, is visible to an observer at the latitude of Mount Wilson, in the spring, above the southern horizon. Even small telescopes or binoculars reveal their blazing centers and sparkling outer edges. Shapley chose these objects and a few others for his intensive studies of the colors and magnitudes of stars in globular clusters. When he began his studies, he thought at least some of the globular clusters comparable to the Milky Way system in size, about 20 000 light-years in diameter. Indeed, in the mid-1910s the belief that globular clusters were island universes, and evolutionarily related — somehow — to spiral nebulae, was not uncommon. 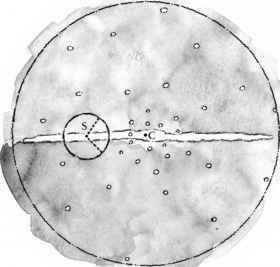 But clearly, the globulars differed in shape from the flattened Milky Way system, and Shapley noted other differences. For one, the brightest stars in the neighborhood of the Sun are the massive blue stars (the O or B type stars), while in the globular clusters, the brightest stars are red. This difference in the color of the brightest stars suggested that the mix of star types was different in globular clusters and in the Milky Way system. M3, and the Small Magellanic Cloud. For this early study he used a combination of techniques to arrive at the distances, including a version of the ''faintness mean farness'' principle (see chapter 4) and the distances as indicated by the Cepheid period-luminosity relationship. As we saw in chapter 7, Henrietta Leavitt had noticed that the brighter a variable appeared at its maximum, the longer the time it took to cycle from maximum to minimum and back to maximum. This meant that Cepheid-type variables could, in principle, be used as ''standard candles.'' 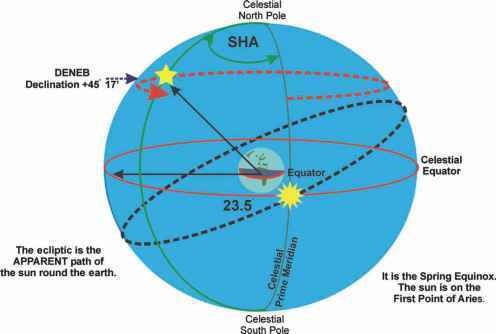 If Cepheid A were brighter than Cepheid B of the same period, then Cepheid A must be closer. If just one Cepheid ''candle'' could be found in a cluster and compared with another Cepheid, the distance of the cluster relative to the comparison Cepheid could be determined. The Cepheids' distinctive light variation and high brightness at the maximum of their cycle made them easy to pick out of a crowd of stars. The hitch was that astronomers could use them only to determine relative distances—until Hertzsprung established a scale according to which the period of a Cepheid variable could be used to predict its absolute luminosity. rise to the appearance of asymmetry from our location (figure 8.2). Shapley recalled Bohlin's suggestion for the sake of argument, but dismissed it because Bohlin's proposal was incompatible with the distances Shapley had derived for the globular clusters. However, Shapley would later return to the problem of the asymmetric distribution, having concluded that it provided an important clue to how his puzzle pieces fit together. No doubt Kapteyn urged Shapley to check into the possibility that interstellar absorption was affecting his results. Shapley might have attributed the dimness of globular cluster stars to distance and not to the fact that they were partially obscured, in other words. Kapteyn had a life-long fear—well justified, as it turned out—that his star-counts would be vitiated by obscuration. Edward E Barnard, an astronomer at Yerkes Observatory near Chicago, had shown that obscuring matter definitely existed in clouds. The only lingering question that the astronomical community faced was whether obscuring gas and dust was also more thinly distributed throughout space. Shapley did his homework. To detect dust and gas particles he looked for their effect on the colors of stars. As in the Earth's atmosphere, particles in space scatter blue light and allow red light, of a longer wavelength, to continue unimpeded its journey between the source and the observer. Like Kapteyn before him, he therefore looked for reddening of stars. But how to tell if the stars appeared redder than they would have in the absence of dust? Shapley had to rely on the assumption that in general, samples of stars nearby have the same mix of colors as stars in more distant globular clusters. The greater distance of the globular cluster stars, in this analysis, should allow for more reddening from interstellar dust, and a mix of stars that appeared to include more red ones. The assumption was a risky one, but one he had to make in order to proceed at all. In 1916, and again in 1917, he reported that he had found no such reddening effect. In the plane of the Galaxy, he acknowledged, space might not be perfectly transparent, but in clusters from near the galactic pole down to a few degrees above or below the plane of the Galaxy, he had found faint, very blue stars. It didn't seem possible that these faint blue stars would be visible if interstellar dust acted as expected. He stood by his large distances to the globulars.